Once you’re done with knowing, analyzing and organizing your information, you need to 1) secure and 2) share your information with caution. These are the seventh and eighth Identity KAOS principles. Your personal information categories are now defined and we need to address the level of protection you want to assign to each category. Some categories may require the same level of protection measures such as bank and brokerage statements. I personally have a locked file cabinet where I keep all the statements related to credit cards, bank accounts, brokerage accounts, utilities, etc. I keep all the credit cards, passports, social security cards, and government issued documents in the ECD (Extremely Confidential Documents) category and under tight control. By the way, the personal information inventory list created in the first step falls under the ECD category as well because you have just listed extremely confidential information which needs to be protected. You may consider a fire proof safe box at home or an external safe box to keep all your valuable items including your personal information. You may even consider using both safe boxes to store most frequently used ECD items such as credit cards at home, and less frequently used ECD items such as social security cards, passports, and other government issued documents in the external safe box. • Why is my information needed? • How will my information be used? • Whom will it be shared with and why? • Where will it be stored and how will it be protected? • What happens if I refuse to share my information? • What law requires me to share my information? 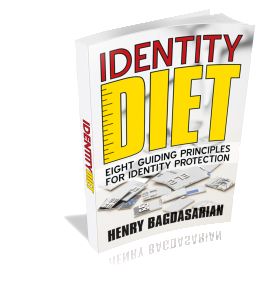 • Is sharing my information increasing my identity theft risks? One area where consumers are excessively sharing their personal information is related to credit and debit cards. We tend to use our credit cards for all transactions without giving much thought to the identity theft risks. Most often, there is no major benefit in using credit cards for small and frequent purchases such as when buying multiple daily coffees, however, the risk of identity theft further increases each time we share our credit card regardless of the transaction amount. Therefore it is very important to think about the risks of our actions before it’s too late. Credit and debit card best practices are further discussed in the next section. Other security measures such as home security, travel security, computer security, and car security must be considered when establishing procedures for the security of your personal information or privacy of your client personal data. Visit this page for identity theft prevention articles after you have learned about securing your information.